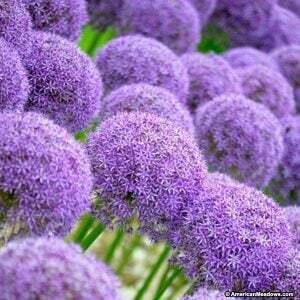 I don’t know about you, but given the choice, I would rather eat outside in my garden. It doesn’t matter if it’s a quiet breakfast with just me and the songbirds, or a big family get together, outside is better. But, I kinda hate my table. It’s glass, it’s not my style, and it doesn’t mesh with the outdoors well at all. 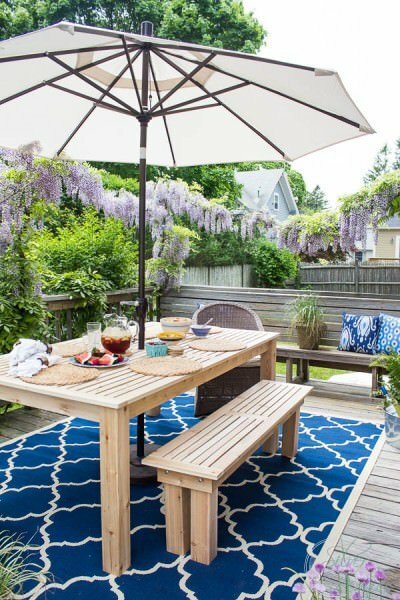 So we found these DIY outdoor dining table projects so that we can all find a way to eat al fresco just a little bit more, and still have a styling’ backyard. Sound good? Thought so! Let’s get to it so you can pick one and get started! 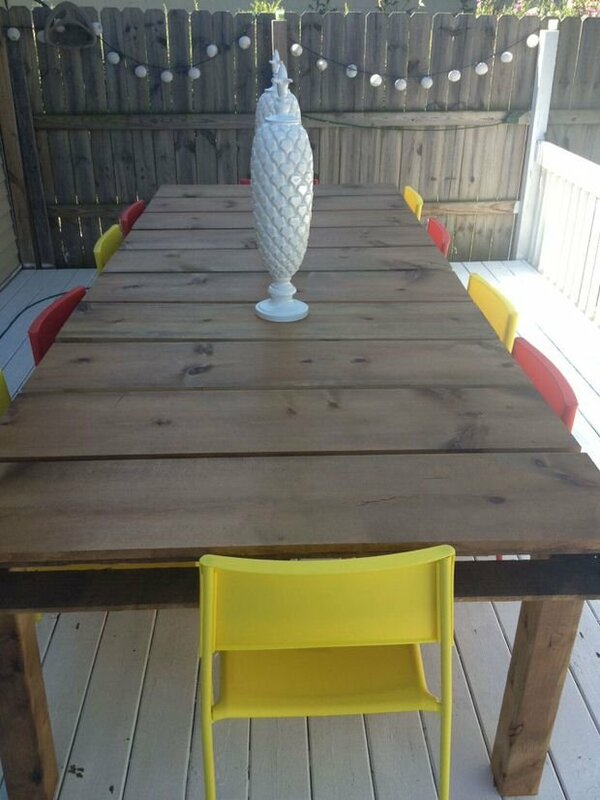 First of all we have a DIY outdoor dining table from Christine at ‘Pinspiration Mommy‘. She built this large outdoor table herself for her 40th B’day! Ok, I like this girl. Great tutorial and plans for this table. 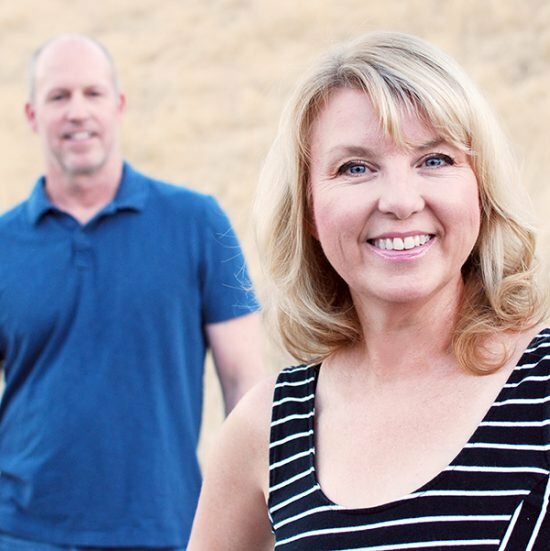 Melissa (and her husband Randy!) 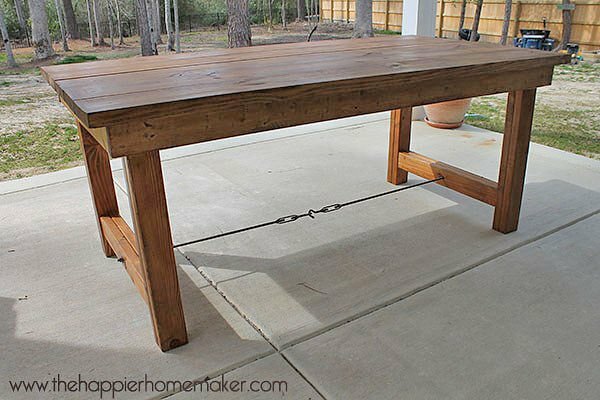 at ‘The Happier Homemaker‘ has this tutorial for their Pottery Barn inspired DIY dining table that only cost them $60 in lumber! 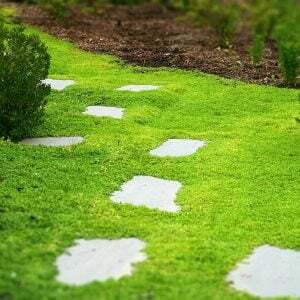 Check out the post, her husband used simple plans from ‘Ana White’, another tutorial, and his own great ideas to come up with this. 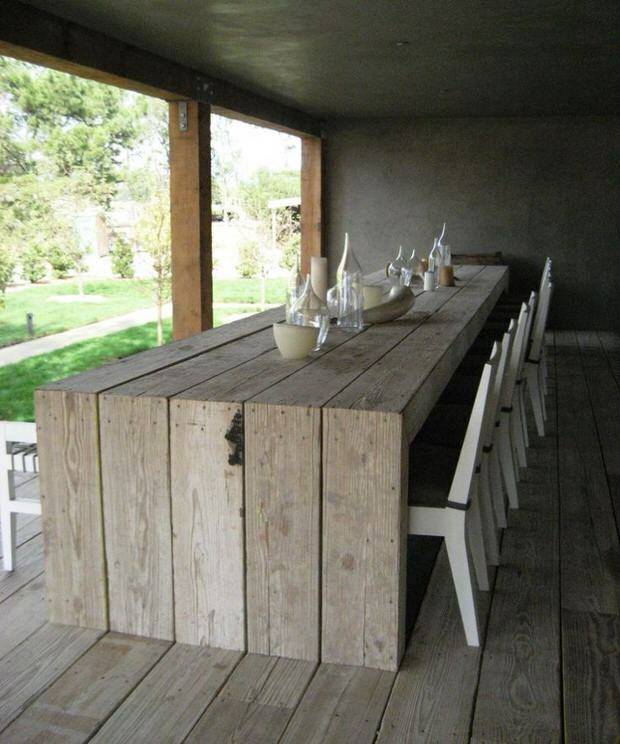 Amazing DIY outdoor dining table! 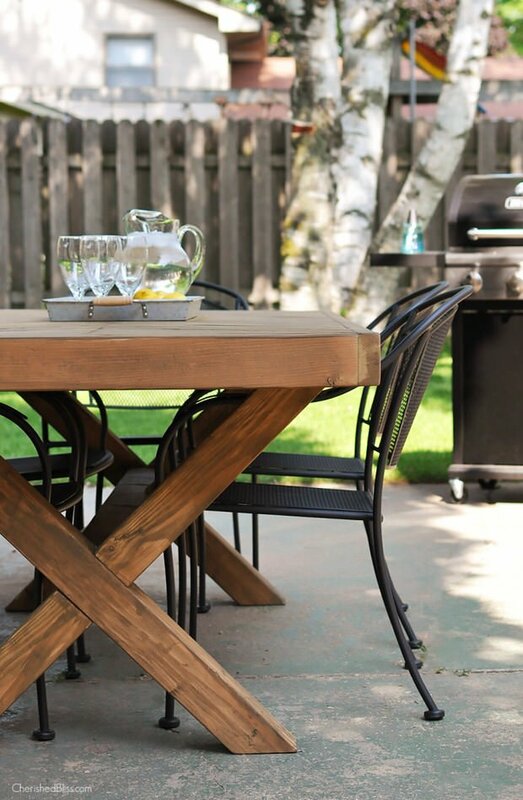 Ashley at ‘Cherished Bliss‘ not only has a great tutorial and photos for her DIY outdoor dining table, she has free plans you can download too! We love the X-frame base of this table. 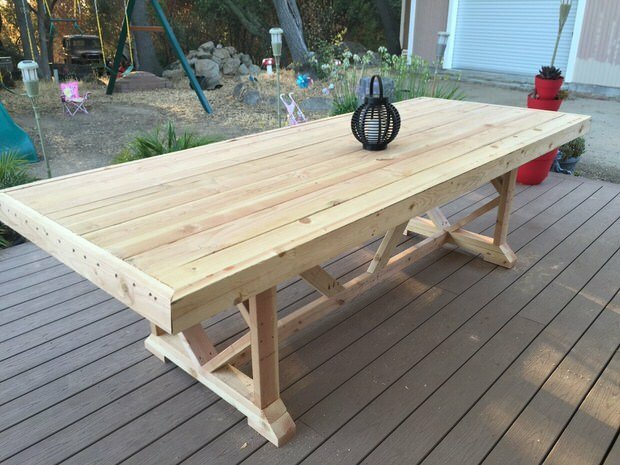 This simple outdoor dining table was made with plans from ‘Ana White‘ and submitted by one of her readers… This looks like an expensive teak table we saw at Room & Board last season. From Danielle (and Luke!) at ‘Finding Silver Pennies‘, learn how to build an outdoor dining set. Lot’s of good directions here, and this set looks high end. Love it! 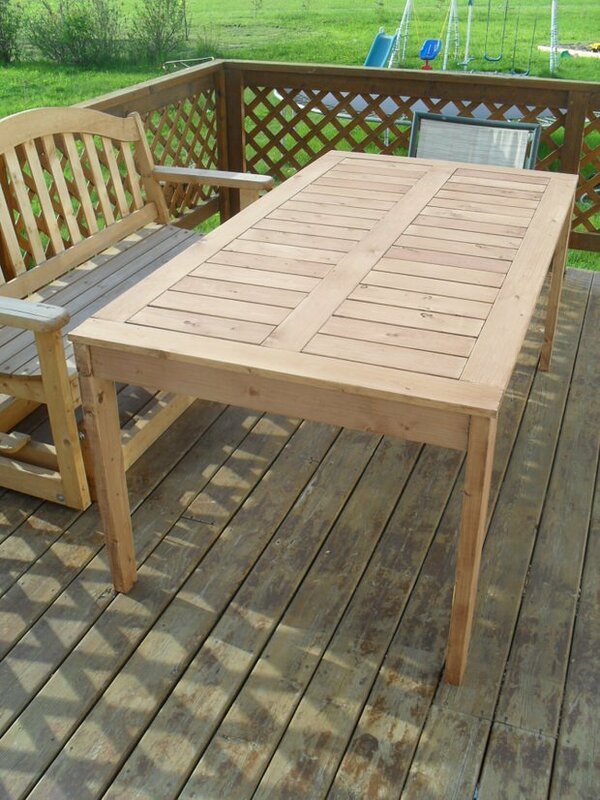 Make this DIY outdoor dining table from wood pallets with ‘A Mitten Full of Savings‘. Oh, did we mention? Less than $100! 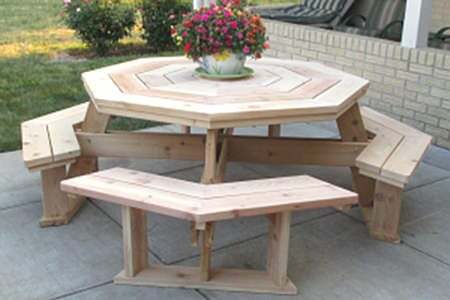 If you have a smaller patio, or just prefer a round table, make this octagonal DIY picnic table with these free plans from ‘Bobs Plans‘. 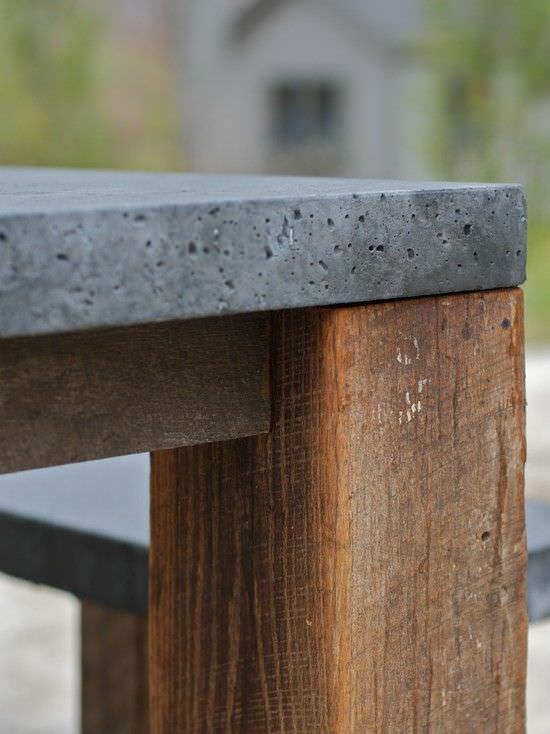 We LOVE this concrete DIY outdoor dining table we found on ‘Houzz‘, but it didn’t come with a tutorial… So we went and found one for you! This tutorial from ‘DIY Pete‘ is almost identical. Ok, last one for you is just inspirational, ’cause it is so cool, we couldn’t leave it out! How amazing is this? From ‘Erin Martin Design‘. Wow! 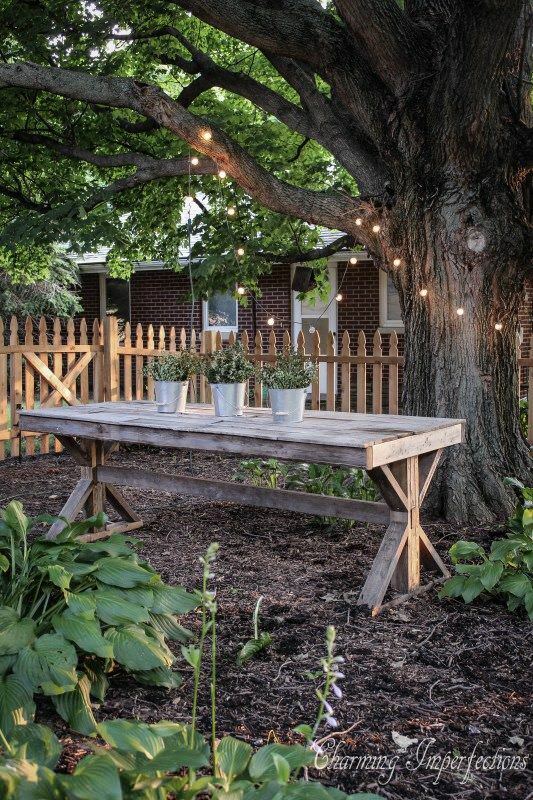 Ok, now you have big plans to make your own DIY outdoor dining table, right? Good, pin it for later! 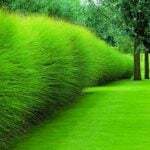 Then jump on over to our posts on DIY outdoor kitchens and DIY backyard projects for relaxation! 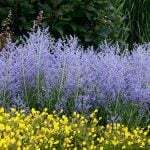 I don’t know about you, but given the choice, I would rather eat outside in my garden. It doesn’t matter if it’s a quiet breakfast with just me and the songbirds, or a big family get together, outside is better. Just realized I never wrote to thank you for featuring my table on your list! Thanks so much for sharing my project, now for my 41st birthday, the plan is to make matching benches for my table! 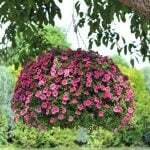 :-) Love your website! Thx for making such a cool project Christine! Let us know when you do the benches, we would love to add it to the post!